Well, not so much a war as a sensible discussion about the various versions of the Tunnels & Trolls rules that are available. They all have their pros and cons and here are a few random thoughts about them. 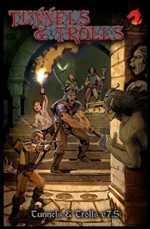 Fifth Edition - This is where I started playing rpgs. At age 13 in 1980 someone at my school showed me a T&T solo. I think it was 'Beyond the Silvered Pane' and having created my first character over one wet lunch hour I was hooked. That weekend I walked into town, no point wasting money on the bus fare, and bought the fifth edition rulebook. Even now when I pick it up (I still have the original one) I start to feel that frisson of excitement that I felt then even though 30 years have passed since that day. Version 5.5 - I'm not entirely clear when I picked up this slightly updated version of the rules. Some time in late 2005 or early 2006 I guess. Most notable changes in this version of the rules were the addition of a separate attribute for magical power - Kremm - and the appearance of 'spite' damage to the combat rules. The former rather made up for the inherent weakness in all magic-users whose STR and, therefore combat adds, dropped after spell casting prior to this. I'm a big fan of 'spite damage' and the concept of 'special damage' that goes along with it. 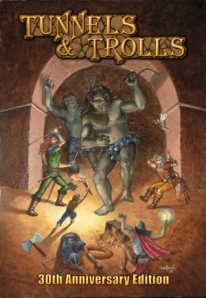 This is probably my favourite set of Tunnels & Trolls rules and the one we used at TrollCon UK this November. 30th Anniversary Box Set. The 7th Edition. 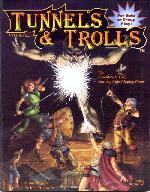 Hot on the heels of ver 5.5 came this special box set to commemorate 30 years of Tunnels & Trolls. This was a more thorough update of the rules. If the previous update had seen a little bit of tinkering and introducing some of Ken St Andre's 'House Rules' this was an overall reworking of the basics with some fundamental changes to the level system and how experience allows attribute enhancement. There was also the introduction of new character classes and talents plus the addition of the WIZ attribute and its impact on casting spells on other characters. The latter idea remains a significant sticking point to my mind. The simple fact that a character has a greater WIZ attribute, even by a single point, while I would concede it should perhaps reduce the chance of that character being able to cast a spell on the higher rated individual I don't like the fact that it stops it outright. Well as the Trollgod says if you don't like a rule change it or don't use it. I think some modification of the required INT SR depending on the difference between the two WIZ ratings might be the answer but I haven't sat down and worked out the details. One day perhaps. 7.5th Edition Box Set is launched in October 2008. Were there any significant changes to the previous rules to warrant a new version? Well, possibly not but there was a general tightening of the concepts seen in version 7 including a 10 fold reduction in the amount of experience points needed to increase an attribute. Sections on poisons and antidotes and quite an extensive random treasure generator were welcome additions. Also, the armour and weapons glossary and the combat examples that were included in pdf format on a CD-ROM in the anniversary product appeared in the main booklet in this release. 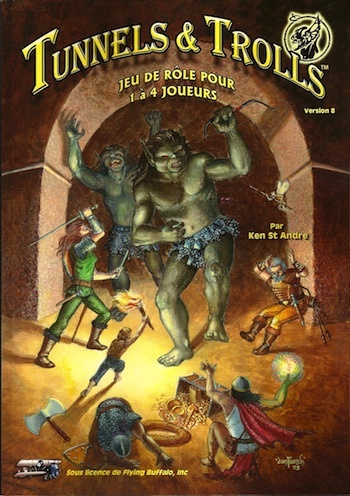 8th Edition Rules in French March 2012 and what the Trollgod himself, Ken St. Andre , has called possibly the best version of T&T ever is released. Patrice Geille, Grrraall from Trollhalla, has done a superb job of translating the 7.5 rules into his mother tongue while tidying up the editing and, best of all, getting the inestimable Liz Danforth to produce lots of new illustrations. Congratulations really are in order to Patrice for doing such a brilliant job and he's planning several other french language T&T projects in the next few months.